Tafraoute: for Nature Lovers and Adventure Seekers! Take in Tafraoute on an Anti-Atlas circuit including Taroudant and perhaps Tiznit, or on a trip inland from Agadir on the Atlantic Coast. There is plenty to see in the area for a full day’s sightseeing (transport is pretty much essential), but the best thing about Tafraoute is that it is surrounded by such diverse landscapes enabling the visitor to uncover heaps of Amazigh (Berber) history and culture. The roads to and from Taroudant feature old granaries, hilltop Kasbahs, abandoned villages and verdant palm oases. Tafraoute is the perfect base for climbers, hikers and those interested in exploring Berber culture in the surrounding hills. Although guidebooks generally mention the town’s key sights (see below), the real beauty of Tafraoute is the drive to and from the town. Road R105 runs over the tail end of the Anti Atlas mountains from Agadir to Tafraoute through the village of Ait Baha. On the way, stop off at Kasbah Tizourgane which has been lovingly restored by returning members of the original tribe which built it. You can even sleep there! On other hill tops along the way, spot crumbling adobe granaries (used to store grain and valuables in turbulent times) and villages. The road to Ait Mansour, which runs southeast out of Tafraoute is also well worth a detour. Rising away from Tafraoute over rugged inclines dotted with sheep, it eventually descends into a shady palm oasis fed by a babbling river, where roadside cafes and shops provide a chilled drink under the trees for passing travellers. This is the long way round to Tiznit (over the dramatic Col de Kerdaous – avoid the hotel here) but it’s worth it! 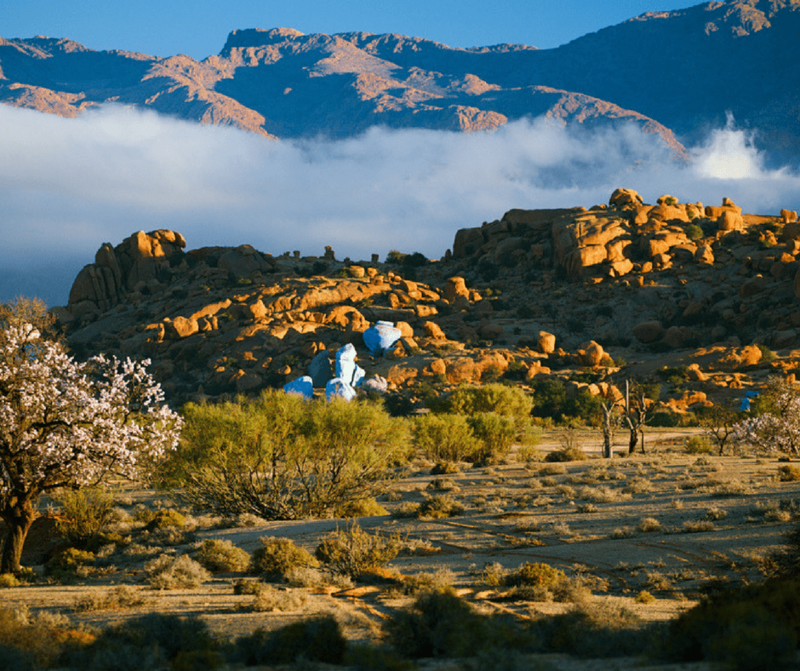 The other sights of Tafraoute are well-documented and are mainly based in the local rocks. 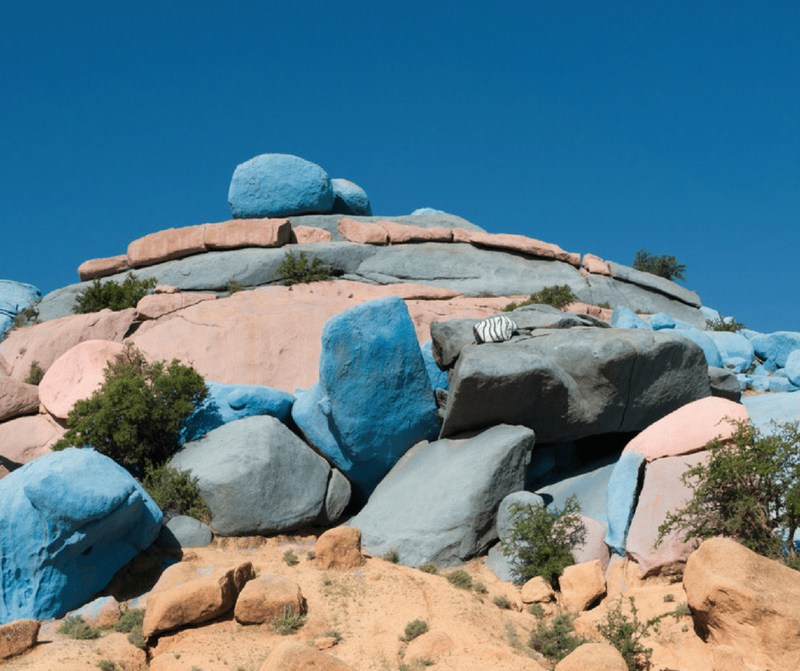 The so-called gazelle rock carving a mile south of town, the painted rocks (painted by a Belgian artist in the 1980s) and the Napoleon’s hat collection of boulders on the way out of town towards Aguerd Oudad are worth remarking in passing, but nothing much to write home about. Much more worthwhile is the Maison Traditionelle in the Ammeln Valley, a house preserved to demonstrate village life in the days before most of the men left to seek work in big cities such as Casablanca, Tangiers, Marseilles and Brussels. Descendents of the original owners have restored the house and a guest house next door and offer an informative and entertaining glimpse of life in a Soussi village. It is unlikely you’ll be visiting this area without transport, and there are two accommodation options slightly out of town which far outshine those in the town centre. Auberge Kasbah Chez Amaliya sits under the mountains of the Ammeln Valley and offers suites around a large pool as well as a popular restaurant. The Dutch owner, Liesbeth, is a mine of useful tips and information on the local area. El Malara is a French-owned property, built in a modern country house style with a pool with nine rooms, including what they call the sheepfold – a small space incorporating 6 beds ideal for a group or family. Despite the abundant local produce, Tafraoute is no culinary capital. Other than eating at your hotel, a solid option is La Kasbah on the Route Imiane (R107) which heads out of town towards the painted rocks. The menu mirrors those of tourists restaurants up and down the country, but the quality is good, the prices are reasonable and beer and wine are served. Popular with backpackers, bikers and hikers, there are always plenty of people to share travellers’ tales and tips with. Tafraoute is known for colourful embroidered babouche slippers – the patterns indicate the wearer’s marital status. Market day is Wednesday, an opportunity both to pick up souvenirs and see locals buying and selling essential provisions. 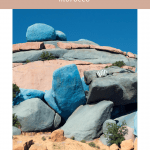 Although the town of Tafraoute won’t occupy much more than a day of sightseeing, it is a great base from which to explore the surrounding area and learn more about the Soussi way of life. Often combined on a road trip with its near neighbour Taroudant, Tafraoute is a more modest town offering fewer urban activities and instead plenty of opportunity to explore the peaks and valleys of the Anti Atlas region. 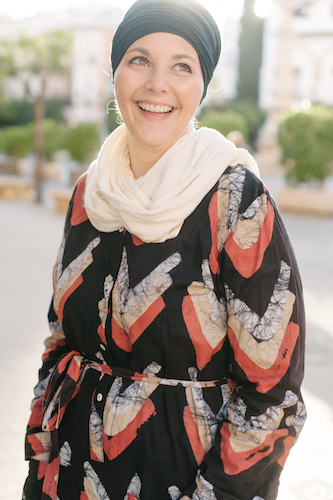 Sorry Amanda, I’ve just gone back to your article and seen that you did mention Kasbah Tizourgane but, fyi, the web page from the link no longer exists!